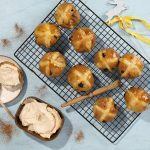 Take this traditional Easter bake to the next level with the addition of creamy caramel cream cheese frosting that makes these vegan hot cross buns ever so moreish! Mix the flour, salt, yeast, sugar, cinnamon, nutmeg, raisins, walnuts, banana puree, and orange and lemon zest in a large mixing bowl. Warm the almond milk, add the warm water and stir into the flour mixture. Then add olive oil and combine. When mixture has taken a dough like form, turn onto a floured surface and knead until smooth. Make the dough into a ball and place in a lightly oiled glass bowl. Cover with cling film and place in a warm place to rise for 1 hour or until doubled. Divide the dough into 12 equal pieces and arrange on a lined baking tray. Cover and let rise for another half hour until double in size. Preheat the oven to 180oC. In a bowl mix the flour and water to create the bun paste. 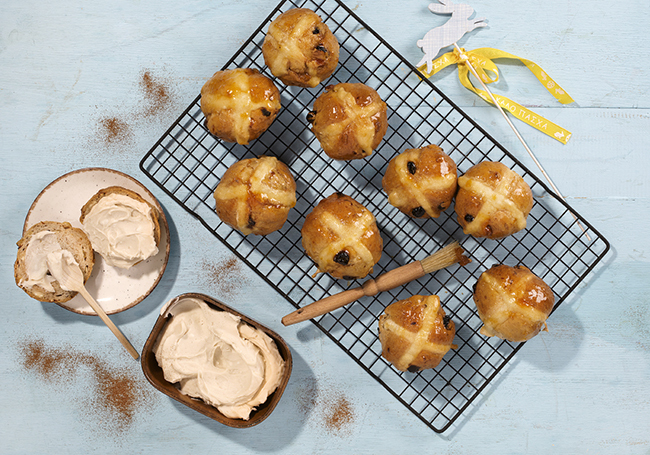 Once the dough has risen, using a piping bag create small crosses on each bun. In a small bowl, mix together two tablespoons of jam and 1 tablespoon of hot water. As soon as the buns are out of the oven, brush each bun with the apricot glaze and let cool on a wire rack. Whisk together the Violife creamy original and the caramel syrup. Cut the buns in half and fill with creamy caramel sauce.